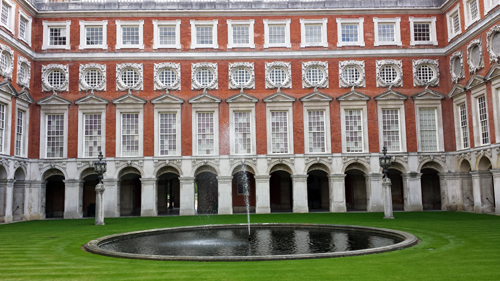 Fountain Court is one of the most homogenous spaces at Hampton Court Palace, with little alteration or reconstruction since its creation by Sir Christopher Wren between 1689-94. 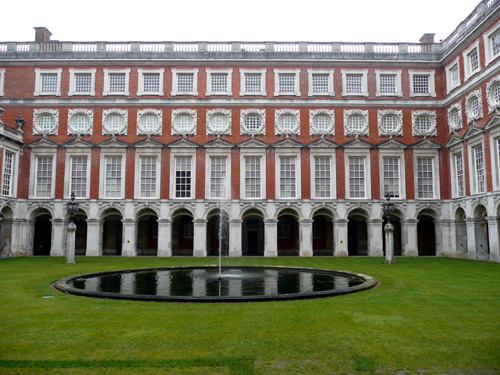 The ranges represent some of the finest Baroque elevations in England and hold the royal state and private apartments constructed for William III and Mary II and used extensively by the royal family until the mid-eighteenth century. The Court is built as a cloister, paved with red and grey Swedish marble, around a central lawn with large round pool and fountain. The centre of the eastern range contains a large entrance lobby which provides access to the park. On the ground floor on either side of this are a series of small domestic rooms, kitchens and also the base of the Cholmondeley Staircase. The Queens State and Private Apartments are on the principal floor and apartments for various members of the court and household staff can be found on the upper floors. The elevation is built in red brick with Portland stone detailing and was constructed between 1689-91. The southern range contains the King’s private apartments on the ground floor and the Kings State apartments on the principal floor. In the centre of this range on the ground floor can also be found the newly-restored Chocolate Kitchen. 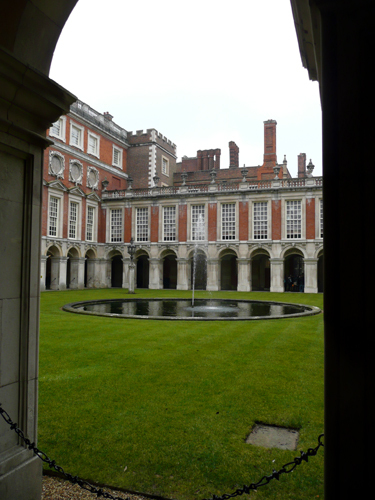 It is the only royal chocolate kitchen in Britain and was built for William and Mary in around 1689. Here is an excellent short film on The Making of the Chocolate Kitchen. 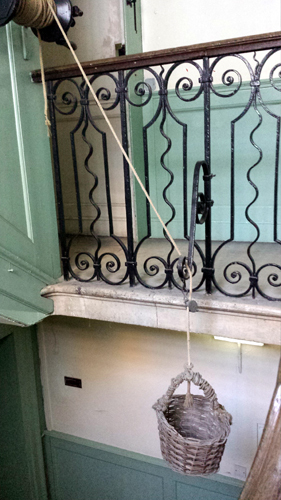 The upper floors were originally used as apartments for various members of the court and household staff. In the SE corner can be found the King’s Back Staircase. The elevation is built in red brick with Portland stone detailing constructed between 1689-91 with only two small areas of nineteenth century refacing. The roundels, which were included to match and balance the oeil-de-boeuf windows on the northern and eastern elevations, contain very faded painted scenes by Louis Laguerre. The western range acts to screen the Tudor parts of the eastern range of Clock Court and create a more unified design for Fountain Court. This range is shorter and thinner than the others, with only two storeys. 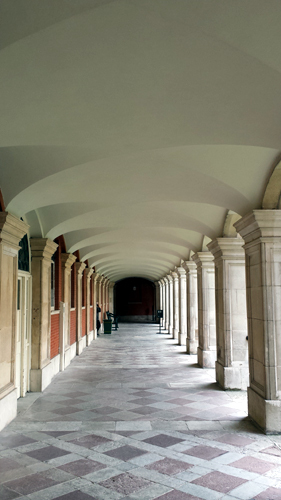 The cloister makes up the entirety of the ground floor whilst the first floor holds the communication gallery, which connects the King’s State Apartments to the Queen’s State Apartments and The Chapel Royal. The elevation is built in red brick with Portland stone detailing and was constructed in 1692. The northern range contains a series of small domestic rooms and accommodation for members of the court and household staff rooms on the ground and upper floors, with two rooms of the Queens State Apartments, the Guard Chamber and Presence Chamber, on the principal floor. The elevation is built in red brick with Portland stone detailing and was constructed in 1691. 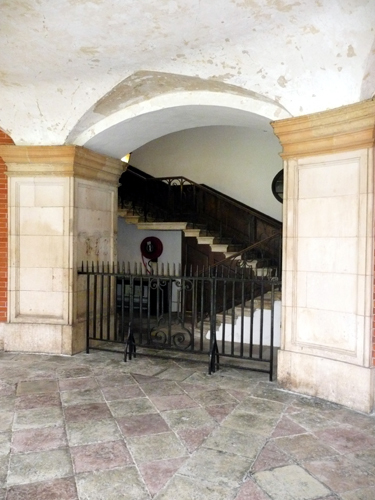 I was tasked to investigate the decorative history of the windows and doors of the four ranges and also the various staircases that can be found at the eastern end of Fountain Court – The King’s Back Staircase; The Cholmondeley Staircase and the Salmon Staircase. 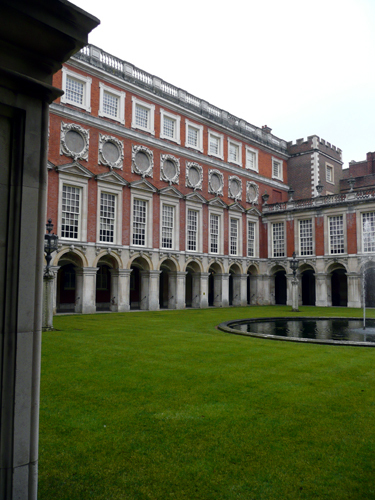 I have also worked on the Chocolate Kitchen, the Ironsides Stairs and the vaults of the Court. I am most grateful to Historic Royal Palaces for the information that has allowed me to complile this account.